Sperry Chalet sits at 6500’ 6.7 miles west of Lake McDonald Lodge. The trail is considered difficult with an elevation gain of 3200’. It was built in1913 by James J. Hill and son Louis Hill of the Great Northern Railway, and was listed as a Historic Landmark in 1987. 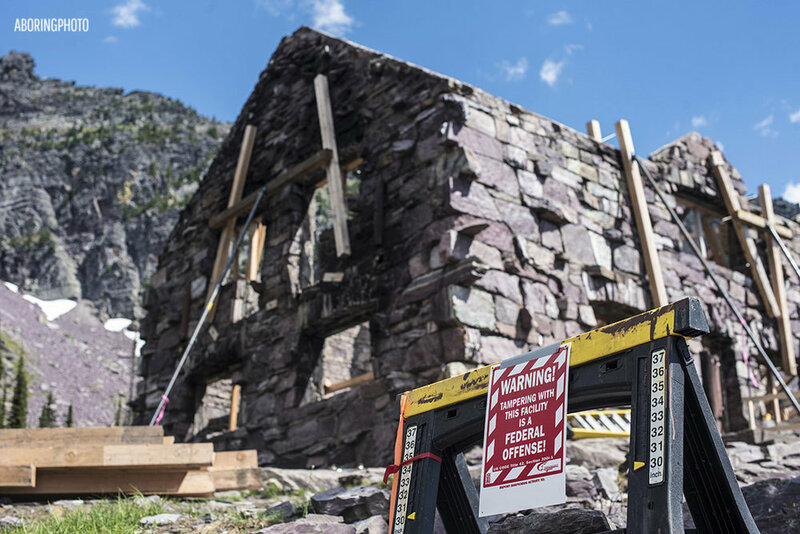 It is built of native rock and had survived the rugged environment for over a century until August, 31 2017 when it was consumed by the Sprague Fire in Glacier National Park. Rebuild of Phase began on July 10, 2018. I have been invited by the Glacier Park Conservancy to chronicle both the buildings reconstruction as well as the people that have contributed to the legacy of Sperry Chalet. The documentation is still in progress and we are looking forward to producing a podcast for everyone to enjoy. There are a lot of people involved in the creation of this next chapter. As we look ahead we are also taking a look back and calling on visitors like you to share your Sperry story. People near and far adore this place and it shows by the outpouring of support. Without the amazing and generous donations from Sponsors of the Sperry Action Fund, this beloved building would not have withstood the harsh winter and for that so many thanks are bestowed upon each participant. I love that each and every individual that contributes to make this possible is etched into Glacier Park history. I am so grateful to be here in this magic place where electricity is scant and cell phones nearly cease to exist. The building, the legacy, the connections, the joy, peace, and kinship that's been created in this backcountry retreat has inhabited Sperry Chalet for over a century. Through it's reconstruction the heart of Glacier Park continues to beat. It will soon be bustling with visitors once again. If you would like have the opportunity to be part of Sperry Chalet’s historical archive at The Glacier Park Conservancy we invite you to share your personal experiences from your time at Sperry Chalet. My first view of the chalet from the trail. It is much farther than it appears here. Thank you NPS for granting me the credentials required to be in this space. The wellbeing of the entire Sperry crew is a first priority and everyone on this project is here by choice. The hike in, high elevation, intensity of the 4 days on 3 days off schedule, and constantly changing weather conditions are not for everyone and a few decided to make their way home. Things found among the debris. NPS Dave. Water specialist, naughty marmot wrangler and relocation enthusiast. A mischievous marmot ready for relocation. No peeing off the porch….or the goats will get you. Kevin Warrington, Sperry Concessionaire, happy to be home. **All donations to this fund will be reserved for projects related to the Sperry Chalet complex.